Not to be confused with United States Senate election in Pennsylvania, 1845. 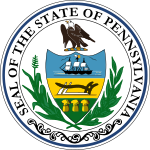 The 1845 United States Senate special election in Pennsylvania was held on March 13, 1845. Simon Cameron was elected by the Pennsylvania General Assembly to the United States Senate. Democrat and future President of the United States James Buchanan was elected to the United States Senate by the Pennsylvania General Assembly, consisting of the House of Representatives and the Senate, in an 1834 special election and was re-elected in 1836 and 1843. Sen. Buchanan resigned on March 5, 1845, after being appointed U.S. Secretary of State by President James K. Polk. ^ a b "U.S. Senate Election - 13 March 1845" (PDF). Wilkes University. Retrieved 22 December 2013. ^ "BUCHANAN, James, (1791 - 1868)". Biographical Directory of the United States Congress. Retrieved 22 December 2013.